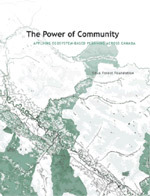 The Power of Community—Ecosystem-based Conservation Planning Across Canada. In summer 2003, the Silva Forest Foundation convened a Community Summit of representatives from the communities where we have completed ecosystem-based plans. Summit participants shared their stories about various ways they have used their EBCPs. Participants, including the SFF, learned from each other about how to refine and more effectively use their ecosystem-based plans. Appreciative Inquiry was used to facilitate the meeting and to assist participants in enriching the possibilities for developing and applying EBCPs. You can read the powerful and inspiring stories of 8 communities in our booklet The Power of Community.